Dec. 8, 2009: Make hot cocoa. Bundle up. Tell your friends. The best meteor shower of 2009 is about to fall over North America on a long, cold December night. "It's the Geminid meteor shower," says Bill Cooke of NASA's Meteoroid Environment Office. "and it will peak on Dec. 13th and 14th under ideal viewing conditions." A new Moon will keep skies dark for a display that Cooke and others say could top 140 meteors per hour. According to the International Meteor Organization, maximum activity should occur around 12:10 a.m. EST (0510 UT) on Dec. 14th. The peak is broad, however, and the night sky will be rich with Geminids for many hours and perhaps even days around the maximum. Cooke offers this advice: "Watch the sky during the hours around local midnight. For North Americans, this means Sunday night to Monday morning." Researchers are interested to see what the Geminids do in 2009. The shower has been intensifying in recent decades and they wonder if the trend will continue. Geminids are pieces of debris from a strange object called 3200 Phaethon. Long thought to be an asteroid, Phaethon is now classified as an extinct comet. It is, basically, the rocky skeleton of a comet that lost its ice after too many close encounters with the sun. Earth runs into a stream of debris from 3200 Phaethon every year in mid-December, causing meteors to fly from the constellation Gemini:. When the Geminids first appeared in the late 19th century, shortly before the US Civil War, the shower was weak and attracted little attention. There was no hint that it would ever become a major display. What's going on? Jupiter's gravity has been acting on Phaethon's debris stream, causing it to shift more and more toward Earth's orbit. Each December brings a deeper plunge into the debris stream. Meteor expert Peter Brown of the University of Western Ontario (UWO) says the trend could continue for some time to come. 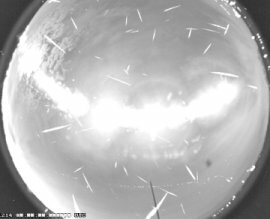 "Based on modeling of the debris done by Jim Jones in the UWO meteor group back in the 1980s, it is likely that Geminid activity will increase for the next few decades, perhaps getting 20% to 50% higher than current rates." A 50% increase would boost the Geminids to 200 or more meteors per hour, year in and year out. "That would be an amazing annual display," says Cooke. Moreover, says Brown, "the proportion of large, bright Geminids should also increase in the next few decades, according to Jones' model." So the Geminids could turn into a "fireball shower." Brown cautions that "other models of the debris stream come to different conclusions, in some cases suggesting that Geminids will decrease in intensity in the coming decades. We understand little about the details of the formation and evolution of Phaethon's debris despite many years of efforts." Recent trends favor a good show. Enjoy the Geminids!